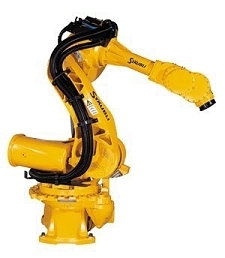 The RX Series scara robots are heavy-duty robots designed for large loads. Each robot has six degrees of freedom, up to 2967 mm reach, and can carry a payload of up to 500 lbs. It was in 1982 that St�ubli Faverges made the strategic decision to specialize in robotics. The diversification process began with the affiliation of the American company UNIMATION, a pioneer in industrial robotics. Ten years later, St�ubli's new-found skills took shape in the RX arm, launched after being designed and manufactured in our Faverges plant. S trong in the success of these developments, St�ubli continued their research and now have a new concept: TX robots. With a reputation for sturdiness, reliability and compact size, St�ubli robots now, more than ever, integrate a combination of high speed, high precision, great dexterity and user-friendliness.